If you're like me, and you live in the Phoenix, Arizona area, you probably love the beauty of the desert. The skies are so blue it's amazing, the mountains have that wonderful "purple majesty" and the desert itself is wonderfully colorful, especially when the wild flowers are in bloom. If, however, you saw the Phoenix desert in the 1860s, you probably saw a very ugly place. In the 19th century, the word "desert" described a place that no sane person would ever want to go, a place of gruesome death. 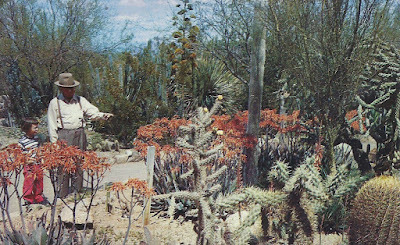 And while I'm out hiking, just loving the Sonoran Desert, it's hard for me to imagine how the Phoenix pioneers saw it. The wonderful cacti (cactuses?) that I love to photograph, and the native vegetation with its delicate beauty, were just weeds back to them. A desert was a terrible place to be. I've often read of pioneers working so hard to clear away all the greasewood, which is the plant in the desert that carries that wonderful smell especially after a rain. And those wonderful blue skies that I love to see so much, especially when I'm golfing, looked terrible to people who were praying for rain. These two points of view are very different, but the desert is the same. So if you're wondering what the desert looked like before the first building was built in Phoenix, in the 1870s, just go take a look at the Sonoran Desert today, there's still plenty of it all around the Phoenix area. And it's looked like that since the end of the last Ice Age, about 10,000 years ago. It's a place of purple mountains, blue skies, and colorful desert plants. And whether you see it as a thing of beauty or not just depends on your point of view. Thank you for looking at the desert with me! Image at the top of this post: The Desert Botanical Gardens in the 1950s, 1201 N. Galvin Parkway, Phoenix, Arizona.